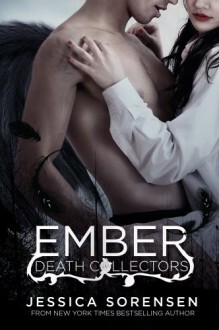 (New adult paranormal version of my young adult book, Ember (Death Collectors, #1). It contains more violence and more sexual content.) **Mature Content Advisory** Recommended for readers 17+ due to sexual situations and language.For nineteen-year-old Ember, life has always been about death. With a simple touch, she can see when someone will die. It’s her curse and the reason she secludes herself from the world. The only person that knows her secret is her best friend Raven. But that changes when she meets Asher Morgan. He’s gorgeous and mysterious and is the only person Ember can't sense death from. The silence he instills in her mind and body allows her to feel things she’s never been able to before, so despite her initial reservations, Ember lets Asher into her life and lets herself to get close to him. But the closer they get, the more Ember realizes that Asher is keeping secrets from her.When unexplained deaths begin to surface in her town, Ember questions why she can’t see Asher's death and what it is he’s hiding from her. Needs some heavy editing but plot idea is very interesting...Angels of Death, Grim Reapers, and Grim Angels who hold the fate of souls in their hands. Looking forward to see where all this leads in the next installment.